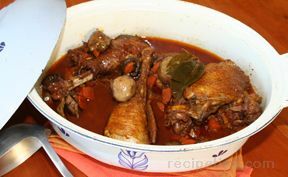 This French classic is traditionally made with an old rooster ("coq") or stewing hen. If neither is available, use legs and thighs from any chicken. In a large heavy skillet, over medium-low heat, cook bacon until crisp. Remove bacon pieces from skillet, leaving 3 tablespoons fat. If necessary, add canola or olive oil to make 3 tablespoons. While the bacon crisps, cut rooster or stewing hen into serving pieces (or use legs and/or thighs). Mix together flour, salt, pepper, paprika and turmeric, if using. Dust chicken with flour mix. Raise the heat to medium and brown chicken pieces, about 4 - 5 minutes per side. Push chicken to one side of pan and add onion, carrot and garlic. Stir to coat with pan juices and simmer for 5 minutes. Dissolve tomato paste in 1/2 cup of the wine, mix with remaining wine and pour over chicken. Add bay leaves, tuck mushrooms in around chicken. Sprinkle with oregano, cover and simmer (don't boil) until tender. Time will vary, depending on the age of chicken used. An old rooster may take several hours; a young bird about 45 minutes. Serve with rice, noodles, potatoes or polenta, with pan sauce spooned over.